Sprites are the dynamic objects that make our game interesting. They are the player you control and interact with, as well as the enemies you defeat. Let’s add a sprite to our game. Go ahead and save the sprite sheet. Because we already included this file earlier when we added background graphics, we don’t have to do anything further with this file. Let’s make some better sense of the vertical and horizontal screen positions. These are just the initial positions, and can be modified later. This will become important when we want to actually move this thing around on the screen. Because we know that each tile is an 8 pixel square, we can initially set them up 8 pixels apart. Placing the ship near $80 both vertically and horizontally will place it near the center of the screen. Sprites within a few pixels of $FF will end up off the screen. The second byte in the row is the graphical tile, which corresponds exactly to the tile in our sprite sheet. This is done the same way we set up our background data. 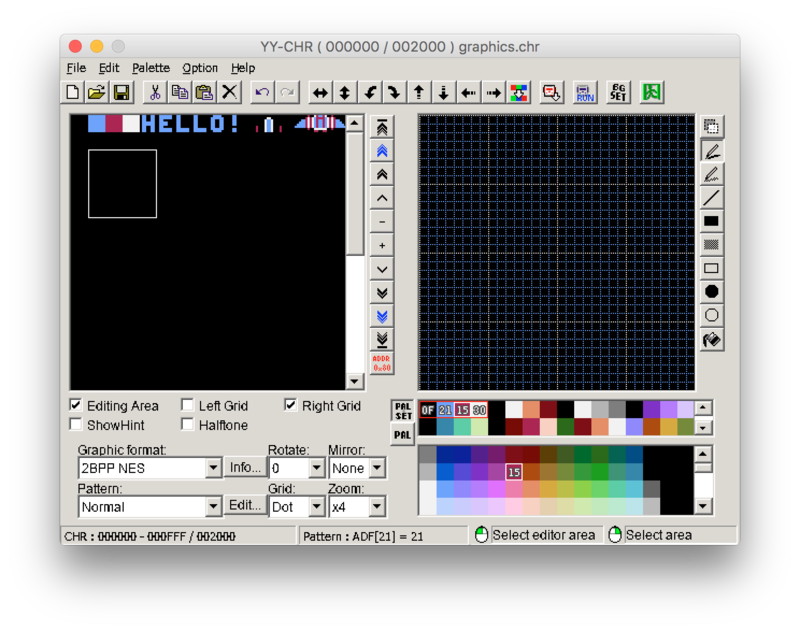 For example, if our sprite attribute byte was %10100011 our sprite would be flipped vertically, behind the background, and using the fourth color palette. Having the ability to flip the sprite is important because it reduces the amount of graphical data we require. 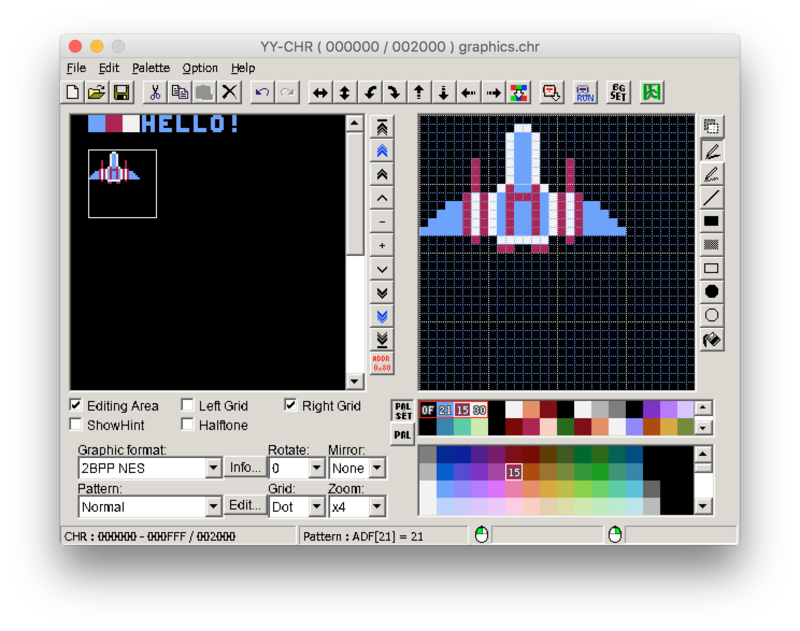 Our spaceship only needs to be drawn facing a single direction in the sprite sheet. If we decide in our game that instead of just facing up we want our spaceship to face downward, we can flip all the sprites vertically by changing that bit in the attribute bytes. Our NMI code now looks like this. So what the heck does that stuff do? This is transferring our entire sprite memory on the CPU to the PPU using direct memory access. We are loading both the low byte and the high byte to get the address $0300 (which is where our sprites live). Once we store this in memory address $4014 we are accessing the PPU and starting the transfer. We will then transfer everything on the CPU from address $0300 to $03FF (256 bytes). With the direct memory access, we can only send 256 bytes of sprite data to the PPU. Because each sprite requires 4 bytes of data, this limits the Nintendo to only being able to display 64 sprites on the screen at a time. Our spaceship takes up 6 sprites of that total. Try to imagine an NES game like Super Mario Bros. Mario takes up 4 sprites, but if he eats a mushroom to become larger he takes up 8 sprites. Add to that some enemies like Koopas and Goombas, a few coins and a mushroom and you’re probably getting close to 64 sprites already. If that didn’t make it hard enough, only 8 sprites can be displayed per scanline. A scanline is a horizontal line all the way across the screen. If we attempt to draw more than 8 sprites in a horizontal line, the 9th sprite and beyond will simply not get drawn. Mega Man is usually 3 sprites wide, taking up about half this amount already with just the main character. Sprite flicker is a mechanic that was added on purpose for some games like Mega Man to allow you to see more sprites on the screen at the tradeoff of graphical flashing. In the next tutorial we will learn how to use a controller to move that frozen spaceship around on the screen.